On July 9, 2015 Mr. Narek Hakhnazaryan, who was awarded a Gold Medal at the 2011 XIV International Tchaikovsky Competition, the most prestigious Prize given to a cellist, played Tchaikovsky’s Rococo Variations, Tchaikovsky’s complex cello composition, with the Los Angeles Philharmonic Orchestra with Lionel Bringuier, Conductor, at the Hollywood Bowl. 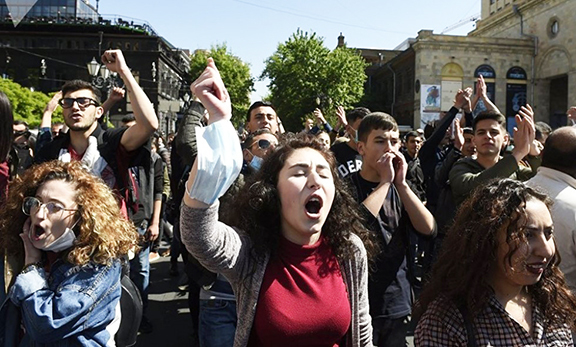 Social change is the popular theme of Armenia’s new generation, where society comes together in order to make much-needed changes in their communities. Swedish DJ and performer Avicii is collaborating with System of A Down frontman Serj Tankian, The Rolling Stone reports. Harutyun Melikyan, a second grade student at Stephan Jrbashyan Music School, took the second place prize at the 5th International Piano Competition María Herrero, which took place in Granada, Spain on July 20-24. System Of A Down bassist Shavo Odadjian has released a collaborative album with Wu Tang Clan’s RZA, The Rolling Stone reports. Armenia will participate as a Country of Honour in France’s MIDEM music industry festival from June 5 to June 8 in Cannes.